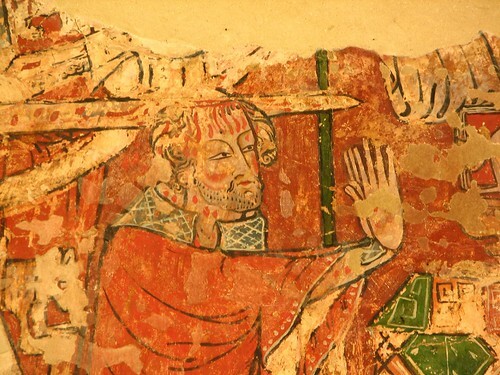 Here are two interesting sites about the martyrdom of St. Thomas Becket. From Catholic Culture: "Given the tempo of the liturgical season with its feasts it is easy to overlook that one saint who for many centuries was, after Mary and Joseph, the most venerated person in European Christendom. Devotion to him spread like wildfire. He was enshrined in the hearts of men, and in their arts. In statues and stained glass, in song and story this good bishop was everywhere to be found: France, Italy, Spain, Sweden. Many miracles were attributed to his heavenly advocacy. — Excerpted from Days of the Lord"
Father Lawrence Lew, OP (who I follow on Flickr and share many of his wonderful pictures here on this blog), wrote this about St. Thomas Becket. "Then the unconquered martyr seeing the hour at hand which should put an end to this miserable life and give him straightway the crown of immortality promised by the Lord, inclined his neck as one who prays and joining his hands he lifted them up, and commended his cause and that of the Church to God, to St. Mary, and to the blessed martry Denys. Scarce had he said the words than the wicked knight, fearing lest he should be rescued by the people and escape alive, leapt upon him suddenly and wounded this lamb who was sacrificed to God on the head, cutting off the top of the crown which the sacred unction of the chrism had dedicated to God; and by the same blow he wounded the arm of him who tells this. For he, when the others, both monks and clerks, fled, stuck close to the sainted Archbishop and held him in his arms till the one he interposed was almost severed. Then he received a second blow on the head but still stood firm. At the third blow he fell on his knees and elbows, offering himself a living victim, and saying in a low voice, 'For the Name of Jesus and the protection of the Church I am ready to embrace death.'" The survival of this icon to St Thomas of Canterbury is rare indeed. Henry VIII had ordered all images of veneration to St Thomas destroyed but here in South Newington, it has miraculously survived, owing to the fact that they were painted in oil on plaster and are a testiment to England's most famous saint. From St. Thomas Becket's last Christmas Homily. Consider also one thing of which you have probably never thought. Not only do we at the feast of Christmas celebrate at once Our Lord's Birth and His Death: but on the next day we celebrate the martyrdom of His First martyr: the blessed Stephen. Is it an accident, do you think, that the day of the first martyr follows immediately the date of the Birth of Christ? By no means. Just as we rejoice and mourn at once, in the Birth and in the Passion of Our Lord; so also, in a smaller figure, we both rejoice and mourn in the death of martyrs. We mourn, for the sins of the world that has martyred them; we rejoice, that another soul is numbered among the Saints in Heaven for the glory of God and for the salvation of men. Beloved, we do not think of a martyr simply as a good Christian who has been killed because he is a Christian: for that would be solely to mourn. We do not think of him simply as a good Christian who has been elevated to the company of the Saints: for that would be simply to rejoice: and neither our mourning nor our rejoicing is as the world's is. A Christian martyrdom is no accident. Saints are not made by accident. Still less is a Christian martyrdom the effect of a man's will to become a Saint, as a man by willing and contriving may become a ruler of men. Ambition fortifies the will of man to become ruler over other men: it operates with deception, cajolery, and violence; it is the action of impurity upon impurity. Not so in Heaven. A martyr, a saint, is always made by the design of God, for His love of men, to warn them and to lead them, to bring them back to His ways. A martyrdom is never the design of man; for the true martyr is he who has become the instrument of God, who has lost his will in the will of God, not lost it but found it, for he has found freedom in submission to God. The martyr no longer desires anything for himself, not even the glory of martyrdom. So thus as on earth the Church mourns and rejoices at once, in a fashion that the world cannot understand; so in Heaven the Saints are most high, having made themselves most low, seeing themselves not as we see them, but in the light of the Godhead from which they draw their being. I have spoken to you today, dear children of God, of the martyrs of the past, asking you to remember especially our martyr of Canterbury, the blessed Archbishop Elphege;* because it is fitting, on Christ's birth day, to remember what is that Peace which He brought; and because, dear children, I do not think I shall ever preach to you again; and because it is possible that in a short time you may have yet another martyr, and that one perhaps not the last. I would have you keep in your hearts these words that I say, and think of them at another time. In the Name of the Father, and of the Son, and of the Holy Ghost. Amen. The movie about St. Thomas Beckett (starring Richard Burton ) is available on YouTube and on VHS via Amazon . St. Thomas Becket links on Diigo.